The most common approach players take on a windy day, particularly when they are playing into the wind, is to try hitting the ball harder. This is the wrong approach to take. By trying to hit the ball harder, you are causing the ball to spin more, which will make the ball go higher, effectively blowing the ball around the course. The aim when playing into the wind is to try and create less spin which will ensure the wind affects the ball less. The question which you are probably asking now is; how do I do this? The simple answer is, swing smoother and slower. You still need to accelerate on your downswing, but do not try to hit it as hard as you normally would. Clearly, you will not hit as far as normal, but it will go further in the wind if you swing it this way. Blasting the ball as hard as you can causes the ball to balloon into the air and not go very far. Many players get intimidated by the wind, when you should be using the wind to your advantage. When you have a breeze blowing across your body from left to right, don’t try to hit a draw against it, unless you are a player that can do this effectively. The best thing to do is to aim to the left and hit the ball into the direction the wind is blowing and let the wind blow it to where you want it to finish. Same applies when the wind is blowing in the other direction. When playing into the wind, be sure to take at least a club more and swing it smooth. You will be amazed how much better the ball will fly. Do not take your normal club and then try to belt it to the green. It won’t make it. The most common mistake for players to make in the wind is to not take enough club when approaching the green. When playing downwind, you will have to take at least one club less, but remember once the ball lands on the green, it will not stop as normal. Plan to land the ball a little shorter than normal and let the wind take the ball closer to the hole for you. When putting, especially on fast green, you will have to allow for the wind. Downwind, it will make the ball roll more. 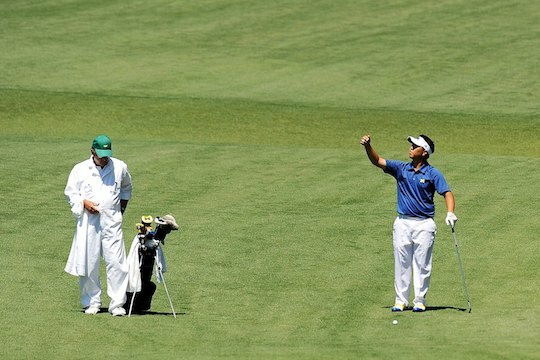 When lining up your putt, aim for less break than normal. When you have a cross wind, you should allow for the wind to take control of the ball, so allow for a little more break from where the wind is blowing. Finally, when putting into the wind, make sure you hit the putt a little firmer. The wind will try to slow your putt down. A little tip to keep in mind; when you are hitting the ball into a left to right breeze it is common for the ball to go a little shorter and land softer. When playing with a right to left wind, the ball will land with more top spin and run further when it lands. Be aware of this when making your club choice.